To begin with, you'll need a base coat. I decided to go for the timeless white/black Houndstooth print -- however, if you're feeling a little more creative, you could do an ombré base or maybe even use a pastel colour. I think yellow/pink and blue/purple are such gorgeous combos when it comes to ombré. As I stuck to the original pattern, I used a white base coat - for this, I applied Essie 'Blanc'. I gave a good three or four coats to ensure the colour didn't look streaky. Once dry, I applied one coat of clear Rimmel 60 Second Nail Polish to prevent the white colour from chipping and to give a shine to my nails. Next, you'll need to draw some squares. For this, I used my black Rio Beauty nail pen. If you don't have a nail pen, you could always use a liquid eyeliner and sketch out little squares on your nails. They can be a little messy looking as they will get tidied up in the next stage. I think it might also be good to point out that you will need to leave quite a bit of space in between the squares (maybe more than I did -- I have quite narrow nails so it restricts how much space I can leave). Once you've drawn out your squares, it's time to fill them in. Whilst filling in the boxes with your nail art pen/liquid eyeliner, you can try to tidy up any lines that are a little wobbly or enlarge the squares if you wish to. Make sure the boxes are filled up to all of the edges. Lastly, this is the easiest part! On the top right of every box, you will need to draw two flicks with your nail art pen/liquid eyeliner -- this will look like a very small 'v' shape/crown on the square. Then, on the top left/bottom right corners of the squares, simply draw a diagonal line coming away from each, like a 'forward slash'. Once you have done that, you should end up with a design similar to the photo above. It is up to you whether you wish to apply a top coat to this or not - when I use a black nail art pen, I often prefer to apply a top coat prior to using the nail art pen. I find that if the black lines haven't fully dried, you will get a lotttt of streakiness, and it is such a shame after spending a long time drawing out the design(!!!). A top coat will ultimately help to preserve the design and stop it from chipping, however. I hope you have enjoyed this tutorial! 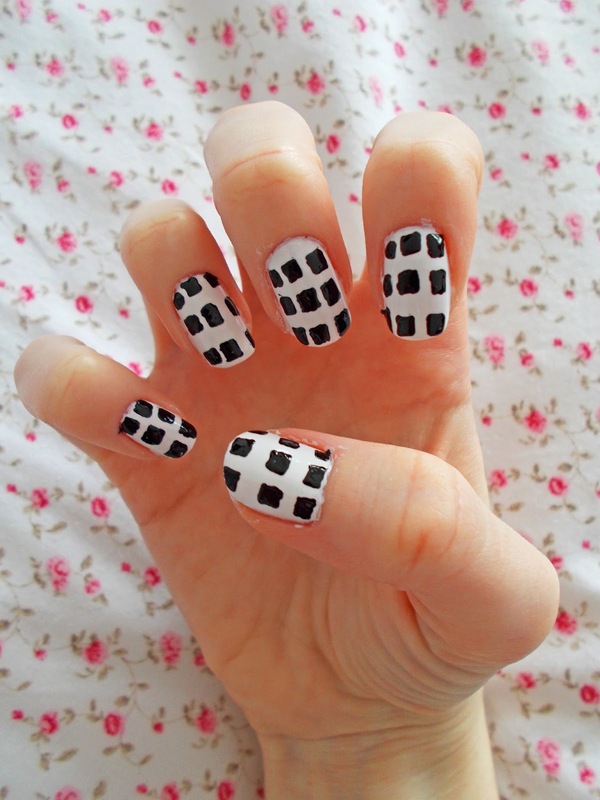 A photo of my Houndstooth nails is actually going to be featured in the next LOOK Magazine (very exciting news!). If you would like any further tutorials, feel free to leave me with your requests :). Oh my god, this such a cute idea! Loved this little post! Thanks for this lovely, I would of had no idea where to start! Looks fab!! This is amazing!! Felt a bit uninspired with my nails lately.. I'm definitely a beginner, but this looks like something I might actually be able to do! Love this tutorial.. Thank you! Ahh these are so cool, I saw that Look tweeted them the other day! What a cute idea! simple too!